Had the programme ever succeeded on a large scale, no doubt we’d hear the Tories complaining today about the fai ling standards of our secondary schools. They would, no doubt, neglect to mention that they helped these failing standards by giving the independent school sector a huge prize; all the smartest kids. 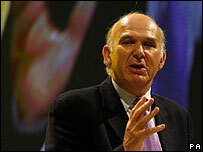 At the Lib-Dem conference yesterday, Deputy Dinosaur, I mean Deputy Leader Vince Cable has basically raked up the whole nonsense by saying that we should send poor but gifted students to independent schools such as Eton and that this will help to increase social mobility within our society. It is an almost comical idea that we could send working class kids from Birmingham or London to Eton. Comical that is for anyone not forced to go themselves. These kids would be bullied for a start. I know quite a few private school types, whether from St. Paul’s or King Edward’s or Eton or Harrow or wherever. That the Lib-Dems would want working class kids associating with these people really says a lot. They are walking, talking establishment apologists. It would be no less indoctrination than sending kids to faith schools. I generalize of course. I do realize that not every child at every private school grows up to be a suited civil servant. Some of them grow up to be David Cameron. If we’re serious about social mobility, let’s abolish the private sector of education. The best teachers stay in state education anyway, mostly because they feel a moral compunction to do so. I certainly do . Yet we’d reclaim for state education the vast number of people in the private sector and we could use that influx to begin tightening up teaching standards. We’d also have an influx of the best parents. It’s an unspoken rule that parents want what is best for their kid and it is true – kids generally do better in exams at private school. That is not at all because it is a private school, but because the people who can afford to shell out generally have a more stable environment for their children at home and moreover are themselves interested in furthering the education of their children. These are the parents that are most active school governors and help supervise school trips and extra-curricular activities. That is why kids at private school do better. If such parents had a vested interest in state sector education, there would be improvement across the board within weeks. That is our goal; levelling up all children, not sacrificing the ability of any child and not allowing money to establish its own privileged elite.